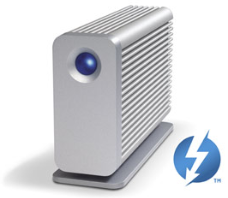 We were pleasantly surprised to when LaCie sent us their latest version of the Little Big Disk Thunderbolt. It's much faster than the version we tested in November 2011. The second surprise was the new and improved Rugged notebook storage device with both Thunderbolt and USB 3.0 ports. We are getting ahead of ourselves. Take a look at the performance numbers. We used AJA System Test with 8.0GB File Size and 2048x1556 10-bit RGB Video Frame Size. The Standard Test from QuickBench includes small random transfers ranging from 4K to 1024K simulating what goes on constantly with OS X housekeeping and certain applications. #1: The latest Little Big Disk is as much as 45% faster than the 2011 model when doing large sequential transfers. #3: The small random transfer test reminds you that not all activity on your storage is going to be super fast. It also highlights the fact that Solid State Drives (SSDs) handle small random transfers much faster than Hard Disk Drives (HDDs). #4: Though the dual drive Little Big Disk is faster than the single drive Rugged, it requires AC power while the Rugged runs on USB and TB bus power. 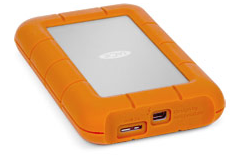 The improved LaCie LaCie Little Big Disk Thunderbolt and the versatile LaCie Rugged USB 3.0 storage devices are welcome companions to the latest Macs with Thunderbolt and USB 3.0 ports. Order them direct from LaCie's online store. You can also order from the Apple online store (use links below). For UK readers, visit Apple Store UK.